A couple of weeks ago I shared my first impressions of the Irresistible Me Flat Iron with you and today I am going to be sharing a full review. 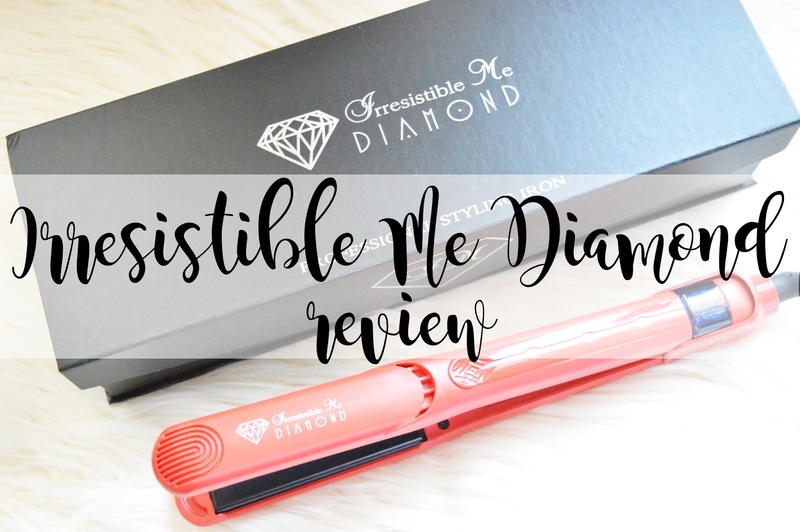 As I stated in my first impressions, I was very intrigued by the Irresistible Me Flat Hair Iron as so many people have mentioned how they are better than GHD's. I would have to say these are definitely better than my pair of Remington hair straighteners too. They heat up extremely quickly, quicker than I ever thought they would. However, the only negative aspect I have found about the heat settings is how they do not count up the heat temperature the way other flat irons do, so you don't know when they're at their maximum heat until you have sat there for a while. I absolutely love how the Irresistible Me Flat Hair Iron has it's buttons hidden underneath one of the irons. This makes it so much easier to do my hair as usually I would press the buttons while using a flat iron, especially when they are on the top of the iron (like most of them are). My brother found it quite silly where they have put the buttons because you'd burn yourself turning them off. But that's where their automatic turn off comes into place. Not only is the flat iron, light but it also doesn't burn your hands the way a pair of usual hair straighteners would as this is made of a type of plastic instead of metal. As well as this, the colour is unique to the brand! I feel they would suit the name better if they were a diamond shade, ssimilar to Irresistible Me Sapphire 8 in 1 Hair Curlers, these are blue which is what a Sapphire is. I found when using these, my hair is still thick and full just like when I have just washed it. I have found when using different flat iron's my hair is left really extremely flat with no volume. I'm not entirely sure how it does this, but I find it absolutely incredible how I'm still left with thick, voluminous hair after using heat on it. How do they do it?! Last but not least, as they state the Diamond Flat Iron heats up very quickly and I mean, ridiculously quick! You can turn these on, brush your hair and once you're done, they're already heated up to the temperature which you require which is insanely good, especially if you are in a rush! I found with straighteners which I used to use, the one aspect I hated about them were how long they took to heat up, it would be minutes until they were at the correct heat which wasn't ideal before school! Have you see my first impressions? These straighteners look fab! I've heard a little bit about this brand and their products seem really good! Lovely review.